West-Prime™ Thermal Aluminum Windows are ideally suited for commercial or large residential applications. The West-Prime™ Thermal Window was designed to handle the demanding requirements of commercial quality windows while maintaining a pleasing, easy-to operate, residential look and feel. 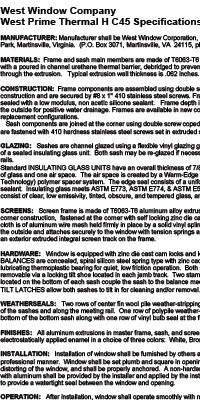 7/8" Insulated Glass for improved thermal efficiency. Both double hung sashes tilt in for easy cleaning. Heavy duty extruded aluminum frame and sash rails for strength and long service life. Four rows of weatherstripping at the interlock, coupled with fin-seal weatherstripping around the sash rails provides one of the best possible seals against air infiltration. 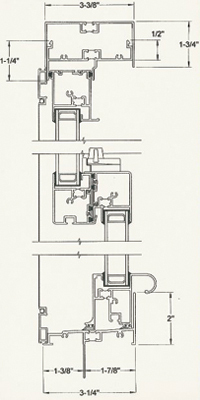 Two rubber bulb compression seals on the bottom sash provide tight closure at the frame sill. Easy-to-operate cam-action sash locks, with two locks standard on windows over 24" in width. Electrostatically applied enamel finishes are durable and long lasting. Large, extruded aluminum lift rail is curved for a comfortable and secure grip when raising and lowering the bottom sash. Concealed, quiet spiral balance system makes raising and lowering both sashes easy. The balance system is fully adjustable, should adjustments ever be required. Optional full or half height screen is made of the same heavy extruded aluminum used in the sash a frame, with aluminum screening standard. Fiberglass screening is optional. The West-Prime Thermal Window is made with glass produced in the USA, as we believe it is of the highest quality available. Matching picture window is available. 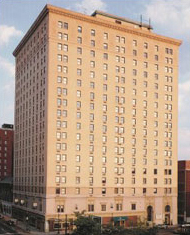 Kentucky Towers Apartment and Office Complex, Louisville, Kentucky. Renovated with West-Prime™ Thermal Windows from West Window Corporation. The West-Prime™ Aluminum Double Hung Window improves thermal performance and create a more comfortable office environment. In the cold of winter, beautiful, durable West-Prime™ Thermal Aluminum windows help keep the cold outside, while the inside stays cozy and warm. In the heat of summer, the interior stays cooler and more comfortable. That's because of the unique thermal efficiency of our West-Prime™ Thermal Windows ... thermal efficiency that's due to our thermal barrier which helps to block the transfer of heat and cold. The interior space stays at the chosen temperature longer ... with less work from the heating and cooling system. This photo clearly shows the importance of the thermal barrier. We set our West-Prime™ Thermal Window frame and an ordinary aluminum window frame on extremely cold dry ice to illustrate how cold is transferred through the frame. Notice that the ordinary aluminum window frame, shown on the left, is completely covered with frost. Now look at the West-Prime™ Thermal Window frame on the right. 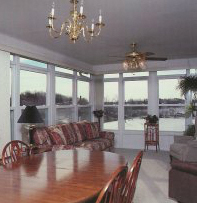 Our thermal barrier resists the transfer of cold from the outside to the inside of the frame. And, of course, the same thermal barrier slows the transfer of heat in summer. West-Prime™ Thermal windows are available in white, tan and bronze finishes to complement any style of architecture. West-Prime™ Thermal Windows make window cleaning easy! No more dangerous climbing or precarious sitting on the sill to clean the outside of your windows. Window sashes tilt into the room for fast, easy cleaning ... or can be completely removed, if desired. Cleaning is likely to be the only maintenance required, and WestPrime™ Thermal Windows make that a snap. Room Enclosures benefit greatly from the architectural strength of aluminum. West-Prime™ Thermal Windows are available in our popular West Comfee Room line of aluminum room enclosures, allowing you to transform ordinary decks and patios into beautiful living spaces with minimal effort.